My art is to further develop and forward Gongbi, a special watercolor art; additionally, to explore art assimilation of eastern art into western art. I like to draw flowers to beautifully highlight rooms. I like to draw people to reflect our daily life where we live. I would like to use vivid pigments and extremely detailed strokes to develop my paintings that everyone can appreciate. My art tries to give people fresh breath and to refresh their minds. Spectators will feel relief and joyful after looking at my art. It is highly regretful that such an elegant and magnificent art is rarely seen in the United States. This art should not be appreciated as antiques, but a masterpiece in a boutique instead. Gongbi has a long history; it has new life and representability as well. 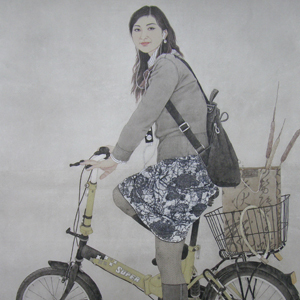 My work is to refill young energy into Gongbi, and to give it a new contemporary life.